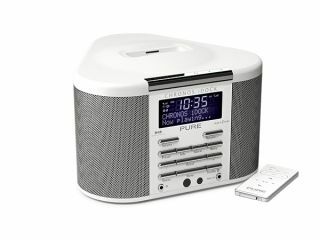 DAB radio expert Pure has thrown a musical lifeline to slow-risers with its new iPod-compatible alarm clock. Not only can the Chronos iDock ease sleepyheads into the morning with DAB and FM radio, it also acts as a docking station for the iPod, so night owls can be gently woken by their favourite tracks. The new Chronos iDock is only compatible with fourth-generation iPods - so you might want to hold off until after Apple's new iPod launches on September 5th. But if you're happy with the iPod you have, the Chronos iDock has a line-input allowing the connection of iPod shuffle flavours, MiniDisc devices and many other portable music players. iPods docked in the unit will automatically be charged and a supplied remote control gives volume and track change functionality from afar. The Chronos iDock delivers stereo-sound and boasts a comprehensive feature set including four independent alarms that can be set for weekdays, weekends, and individual days or as one-offs. There's also an adjustable sleep timer and a large snooze button, which can be set for periods up to 59 minutes. The Chronos iDock is part of Pure's Ecoplus range, which has been designed and manufactured to minimise the impact on the environment. The unit is said to have a standby power consumption of less than 1W and packaging and documentation based on recycled and sustainable materials.